Even if you’re not watching your cholesterol, there are plenty of reasons to avoid eating eggs. Ethical issues aside, industrial eggs provide only about 20% of the energy it takes to produce them. And while some egg substitutes do exist, they often pale in comparison to the real thing. Josh Tetrick, the CEO of Hampton Creek Foods, thinks we can do better. 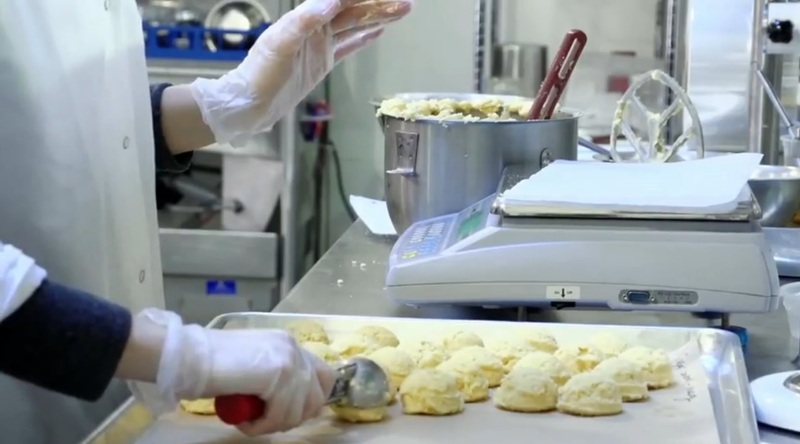 A food scientist at Hampton Creek Foods tests how plant-based egg alternatives function in baked goods. Tetrick’s collaborative team of chefs and scientists is hard at work identifying new egg substitutes. While the details of this research are still proprietary, here is an example that highlights how the basic research process works: The team first chooses a plant-derived molecule or plant product, such as kale powder, and uses it to replace eggs in a common food product. By making mayonnaise with kale powder, the team might discover that kale powder is a terrible emulsifier but gives mayonnaise a nice mouthfeel and a surprisingly eggy taste. Biochemists would then work to dissect the molecular properties of the kale powder that contribute to these desirable qualities. So far Tetrick’s team has tested hundreds of different plant-based ingredients. As with any scientific research, there is plenty of trial and error. “We fail 99.99% of the time,” admits Tetrick, but his team is quickly honing in on the perfect combinations of plant-derived molecules. Their first product, Beyond Eggs, contains peas, sunflower lecithin, canola, and natural gums extracted from tree sap  and may someday replace real eggs in mayonnaise, muffins, and cookies. The team even has an early prototype for plant-based “scrambled eggs” in the works. Take a tour of the Hampton Creek food lab with CEO Josh Tetrick and TechCrunch blogger Anthony Ha. Stone, Brad. “Venture Capital Sees Promise in Lab-Created Eco-Foods.” Bloomberg Businessweek 24 Jan. 2013. Web. 1 Apr. 2013. Tags: beyond eggs, biochemistry, eggs, hampton creek foods, josh tetrick, molecular biology, plants, research. Bookmark the permalink.